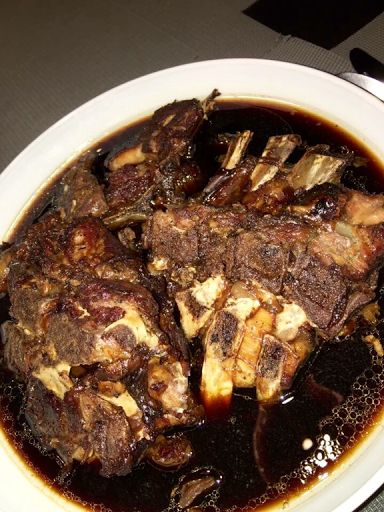 One of my childhood food memories is the ribs I used to eat in my Lola's house. I tried recreating it several times but I could not get it right. Something was a bit off. I experimented last week and my family loved it. Kuya kept on saying it was very good. He even brought home the remaining ribs. Ate said to post the recipe asap. It is not photogenic but I promise you, you will like it. Plus it is so easy to cook. 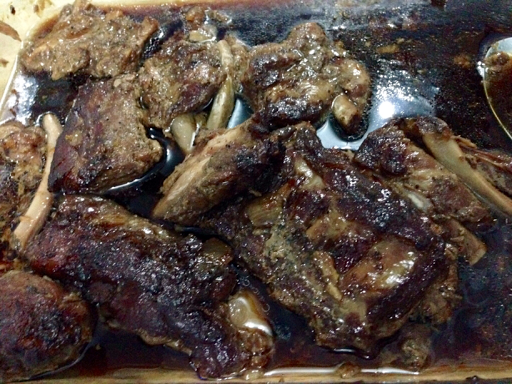 Marinate the ribs in sugar, soysauce, pepper and msg overnight. Put in the slow cooker with water and let it simmer for 3 hours. You can freeze it at this point and cook another day or arrange the ribs in a baking dish. Pour the cooking liquid. Eat with lots and lots of rice. I finally got it right! I have been using brown sugar in the past when I should have been using white sugar. Pinky cooked it yesterday and her family asked her to cook it every Sunday.